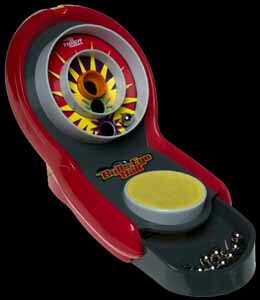 Bulls-Eye Ball is a very simple concept. In fact it's based on that old, pre-electronic, amusement arcade game that the Americans call skeeball. All you have to do is get the balls in the holes and score points - simple. 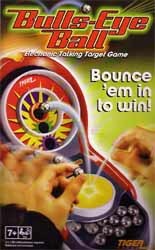 However, Hasbro has upgraded and enhanced this old classic by not only using a trampoline style format, rather than the slope that arcade goers will be familiar with, but the company has also included electronic sounds and lights. The biggest pain with this game is that the ball bearings have a habit of flying all over the place. You are highly recommended to play this in the middle of your living room, otherwise you'll spend your time looking behind cupboards and other furniture looking for your balls. While this game is aimed at children, you can almost bet that they will become pretty bored with it after a few days. However, the older generation - those of us that still remember the original Space Hopper when it was first released - will get hours of fun out of this.